Because of eBay and slow dial-up speeds, Cathy Kothe told her husband to be the first people on the block to get high-speed Internet access. This was the beginning to the largest verified Garfield collection in the world. Cathy officially has 6190 items without duplication and over 12,000 Garfield items in all. Today Cathy Kothe officially holds the World record for Garfield collectibles. 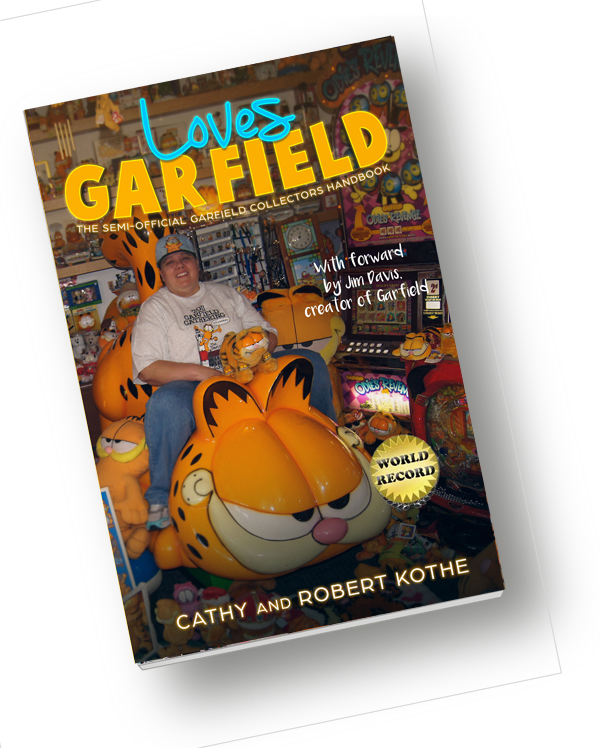 Out of Cathy and Robert's experiences inspired their book, "Loves Garfield - The Semi-Official Garfield Collectors Handbook". This book is like no other Garfield book ever made. It gets into the minds of collectors and explains the community as individuals and as a group. On June 19, 1978 Newspaper readers met Garfield the comic strip for the very first time. Around 1981 the first Garfield merchandise was introduced to the market. In the 40+ years that followed, Garfield became one of the most recognizable characters in history. Documented the “Garfield Trail” and Garfield Related Venues in the Indiana Area. 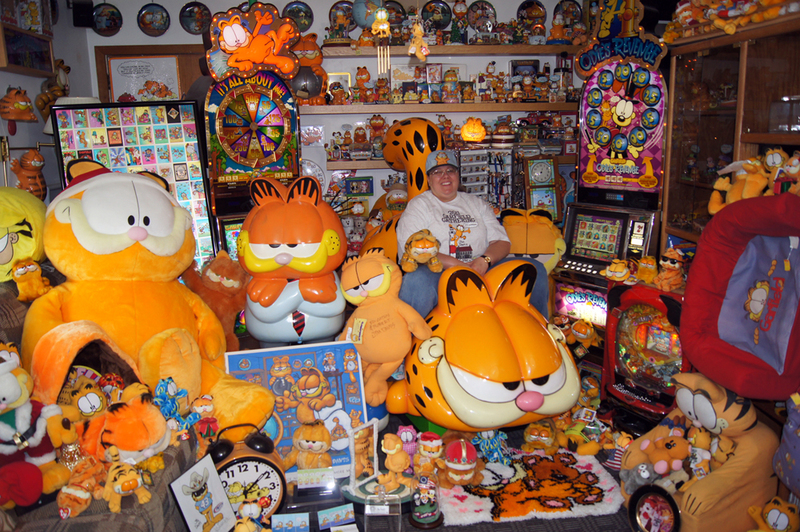 Cathy Currently Holds the World Record Since 2013 with Over 6,190 Unique Garfield Items and over 13,000 Items (With Duplication). Loves Garfield is one of the most complete books written about Garfield and the Garfield collector’s community. This book has over 60,000 words and Thousands of images of Garfield collectibles. Not just for Garfield collectors. If you are not a Garfield Collector you will still enjoy this book. It is part travel book, part documentary, part story book and part Garfield book. 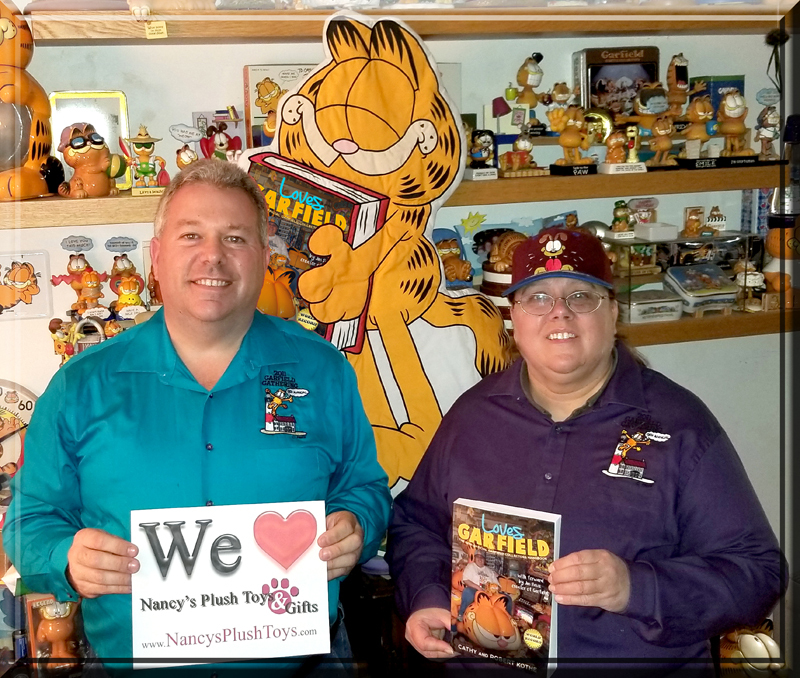 For Cathy and Robert, collecting Garfield is not just a sedentary hobby. It has brought them to places all over the country to meet interesting people and experience exciting adventures. To the Garfield headquarters several times to film and meet with Jim Davis. If you are a Garfield collector you will enjoy a deep-dive into the subject matter. Thousands of the best Garfield collectibles will be show and you will learn the psychology in how to effectively buy and sell Garfield collectibles. The right mindset will be taught on how to buy and sell Garfield and which items are more sought after. Where to interact with other Garfield Collectors both on-line and in the real world. This project is semi-official because it has the blessing and full support from Paws, Inc. the official Garfield company owned by Garfield’s creator, Jim Davis. Paws, Inc. has been in communication with Robert and Cathy for many years and they even provided a forward written by Jim Davis himself. Paws, Inc. is also delighted by the fact that a percentage of the profit will benefit North Shore Animal League America, the world’s largest no-kill animal shelter and animal adoption agency. Only a small number of books have ever been written about Garfield collectables but in these pervious books they only show off many Garfield items and sometimes a generalized price. This book is more concerned about explaining the mindset of Garfield collectors and their interaction with each other when it comes to buying, selling, and socializing. A generalized price is not important however you will be given the tools to make good decisions as it relates to you own collection. As a handbook you will learn how to roughly appraise a Garfield item and even estimate when the item was made. This is important because almost all Garfield merchandise says Copyright 1978 even if it was made yesterday. Are you a Garfield Collector? Do you know any Garfield collectors? Have any of your friends had a Garfield stuck-on-you plush stolen from their car in the 80’s or 90’s? Do you or friends read Garfield in the funny pages? Do you have a pile of Garfield items and don’t think you are a collector? Do you like travel stories? Do you like great photography with thousands of collectible items? Or do you simply enjoy lasagna and hate Mondays? We are trending extremely well on Amazon.com but we do not love the prices they were charging at $50 so we found an additional printer and the prices came down. Nancy’s Plush toys www.nancysplushtoys.com received her first shipment and will be selling them at a great prices as soon as she adds it in to the system. Nancy’s Plush Toys is the hand-picked Garfield-Friendly, United States Distribution partner with 100% Guaranteed inside Color books. Why hand-picked? Because Nancy is actually in the book as the organizer of the Garfield Gathering. Many of the chapters in this book would not exist if it were not for Nancy’s ongoing devotion to the collector’s community. This version of “Loves Garfield” is guaranteed to have color inside pages. We stress this because the initial release of the book on-line, was a bit of a roller-coaster and there is a possibility that books being sold on the Internet may be the lower cost black and white versions. Black and white has since been discontinued however you can’t be sure who is selling what on-line.